Each photographer has contributed a series of photographs whose creation was based on a prominent moment or conglomeration of moments/memories/circumstances that has affected their sense of self. All contributing artists identify as female; as such, the themes developed by the exhibition rely on a contemporary notion of femininity, and how that notion is challenged, reinforced, accepted, or rejected by the participating artists. The threads created by each individual artist, though, are broad enough that the themes are accessible by all visitors to the gallery space—such threads include domesticity, culture, the family unit, and maturing into adulthood. Frances F. Denny questions the roles that the matriarchs of her family have performed through multiple generations, and creates comparisons between the heirlooms passed down through her family with those gender-assigned responsibilities and expectations. Let Virtue Be Your Guide (2015) examines the artist’s family, and their deeply rooted history as early settlers of New England (one ancestor, John Howland, was a deckhand aboard The Mayflower). Unearthing the idea of feminine ‘virtue’ from the confines of its historical meaning, the photographs of the women in her family have a watchful quality, as if the artist is defining for herself what it means to be a woman. 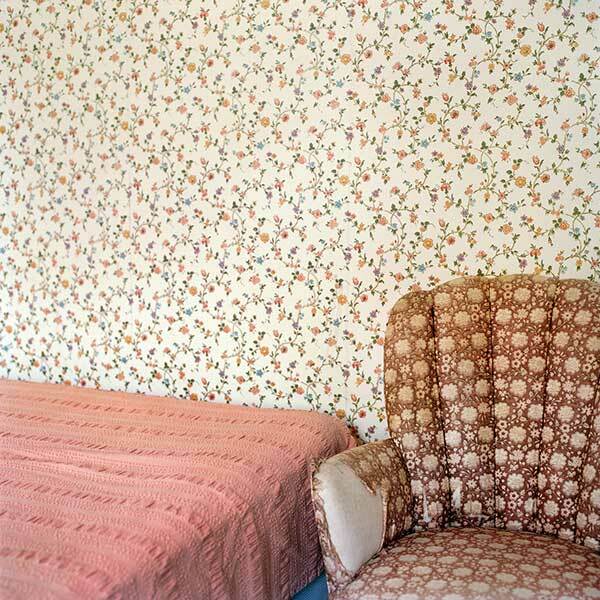 Her sitters, and the domestic spaces they inhabit, together evoke a well-worn privilege. In the photographs, seams pull apart, exposing the shifts occurring across generations of women. The resulting collection of images becomes a search for meaning in heritage, a challenge to the notion of legacy, and the artist’s reckoning with a traditional version of American femininity. Brooke DiDonato explores the moment when a maturing adult returns to their childhood home to find that they have outgrown their previous role in the family unit, but can’t quite place where they belong now. Her House is Not a Home series of self-portraits convey feelings of isolation and discontent experienced when returning to her hometown. In relation to the exhibit concept, DiDonato had a sure sense of herself based on the memories of her childhood home. Upon returning home, she realized that the person she once was no longer existed, and in her failed attempts to secure her identity, she aligned with furniture and common domestic gender roles. Priya Kambli, in a recursive fashion, investigates the notion of culture and familiar attachment through reworking the only attachment she has to her extended family: the photographs she inherited. Sense of Self: Four Female Photographers will tour September 2020 through October 2025. The dates below reflect seven-week exhibition periods. Dates are subject to change; please contact MoreArt@maaa.org or (800) 473-3872 x208/209 for current availability.